Many households nowadays host a variety of appliances and electronics. And with the need to ease our daily routine, we tend to depend on these appliances in our house. However, the more devices you have, the more you are at risk of electronic shortage. Hence, you should consider investing in the best selling surge protectors. A surge protector is designed to prevent any possible electronic shortage and protects your appliances. Not only that, but it can also regulate the level of voltage by sucking the power, so it does not shoot directly at your devices and electronic gadgets. Now, if you are planning to buy a surge protector, allow us to present the top 8 best-selling surge protectors that we’ve found in the market. The following models will not only help you to save money in the long run but can also protect your house from any possible damage that an electronic shortage may cause. Let’s get started with this budget-friendly surge protector from Belkin. This 3550-joule surge protector can shield your appliances from any possible lightning strikes. 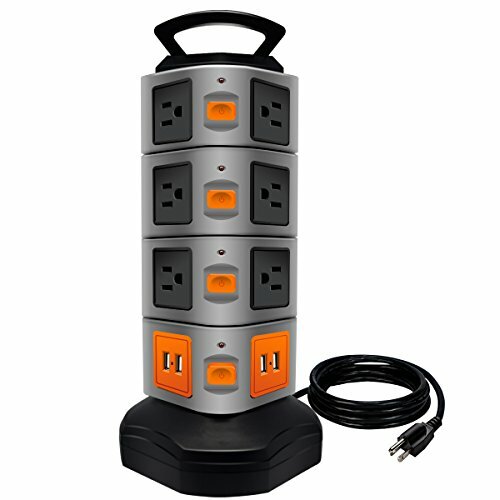 The eight surge-protected outlets and heavy-duty 12-foot power cord is enough to support an average household. Furthermore, it also offers telephone, fax line, and coaxial protection for your convenience. Bonus points for its sleek design with a right-angle plug that does not consume much space. The company offers a limited lifetime warranty and $200,000 connected equipment warranty to give you peace of mind when purchasing the product. This surge protector is most suitable for your office, entertainment room, or any room that uses multiple appliances at a time. Best of all, you can have this low-profile surge protector without draining your bank! It is far by one of the cheapest surge protectors we’ve found in the market just for you. 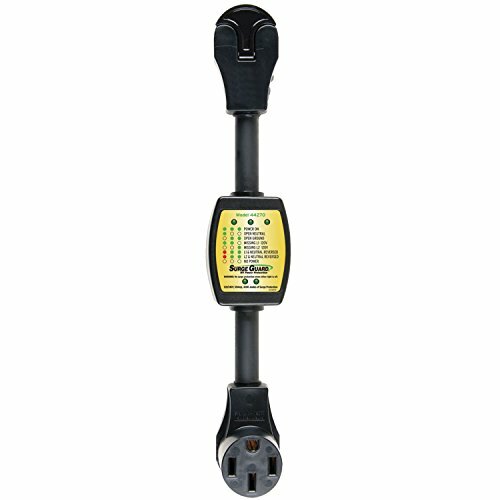 The Progressive Industries portable RV surge protector is durable and ideal for heavy-duty use. It has three modes, and its operating temperature can range from -40C to +105C. Also, the surge protector is resistant to harsh weather and extreme heat. You can use this outdoors and never worry a thing about it. It features a security locking bracket. Taking a look at the exterior, it has a rugged pull handle and robust Lexan housing. The assembly is all weather shield. This surge protector is designed to serve your household for years to come. And most importantly, the company offers a lifetime warranty to their customers. We also have the Surge guard 44270 entry level portable surge protector. 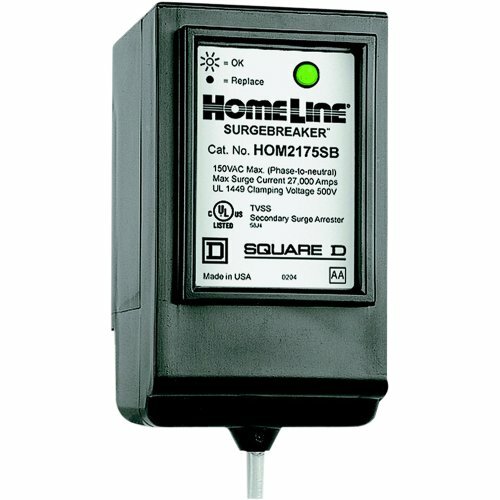 This model can identify a faulty park power plus and offers 4200 joules of surge protection. It works by analyzing the circuits and verifying pedestal powers. Its indicators illuminate, allowing you to see the power status even in dim light. Installation is easy. The surge protector can protect an average household’s number of appliances. You can also put it outside since its housing is reliable and durable. Worry not because it has passed the hurricane test. This surge protector is built to serve your household for many years to come. If you are on a tight budget, you might want to check the surge protector from LOVIN products. It offers multiple sockets and USB connector. The tower vertical surge protector is a space-saver that can protect your household from any risks of electrical hazard. It provides 14 outlets and four USB ports. The universal outlet socket and USB ports are suitable for most countries such as the US. Hence, you can rest assured that it can support all of your home electronics and gadgets. It is also compatible with all types of devices. You can charge this surge protector without consuming much space in your house. The housing is made of premium flame resistant ABS and PVC. The 300W rated power copper core cable can help prevent the electricity from overflowing. This surge protector is designed to protect your household and helps you to save money in the long run. 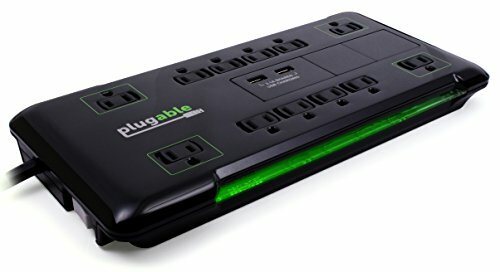 Another budget-friendly surge protector that we have on our list is from Plugable. This 12 surge-protected standard US power outlet has 4320 joules of protection. Also, it has an integrated EMI/RFI filter and two-in-one power and circuit breaker switch. This surge protected is UL and CUL rated. When it comes to its exterior, it has a sleek black design with a sliding safety cover that will prevent you from accidentally getting in contact with the debris and dust inside. The 25-feet cable allows you to get the most out of it and also to avoid fire hazards when using extension cords. Best of all, their customer service is available 24/7 so if you have any questions, feel free to send them a message before placing an order. 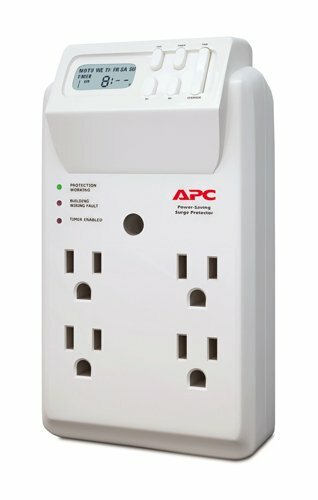 This neat-looking and business-like surge protector from APC is everything you could wish for. It offers 1080 joules surge protection energy rating and six wall outlet surge protector wall mount. You can program the four timer-controlled outlets to turn on or off throughout the day. All products from this manufacturer had undergone the IEEE testing for your peace of mind. It offers primary and ultimate protection to all of your appliances and electronics in the house. The company offers a lifetime warranty and $50,00 connected-equipment protection policy. 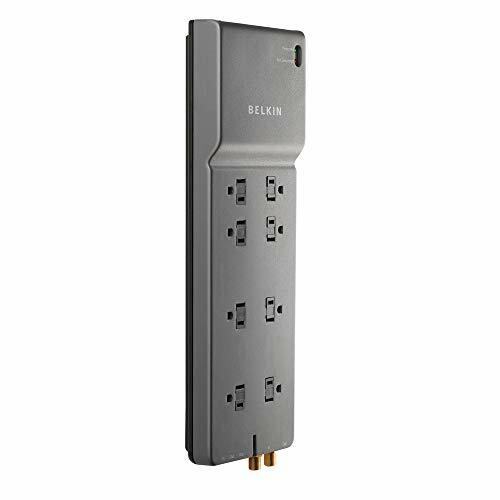 Not to mention that this is also one of the most affordable surge protectors we’ve found online, the ideal choice for customers on a tight budget. The Square D surge protective device provides ultimate protection to your appliances and circuits. This model features an LED indicator, making it easier for you to determine the power level even in dim lights. You can use this surge protector in service entrance locations, timeline load centers, and even CSEDs. The plug-in installation is a breeze and requires two spaces. Once installed, it will control high voltage transients in all of your home appliances. In that way, you can save money in the long run and lengthen the span of your electronic devices. It also helps you to decrease the risk of any fire hazards caused by an electronic malfunction. For our last product, it may not be the cheapest model in our list, but this one is worthy of an investment. 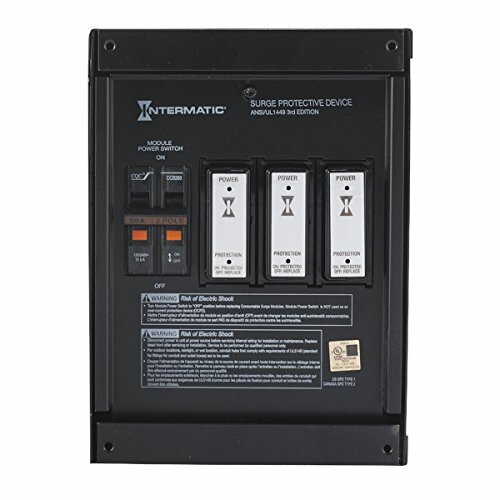 The Intermatic smart guard home surge protector can provide ultimate surge protection to your entire household thanks to its innovative thermally protected metal oxide varistor technology. The package includes three consumable modules and flush-mount kit, allowing you to replace it anytime you want. It also features a blue light that would notify you if the SPD unit is on. The green light will determine if the surge protection is active, allowing you to see even in the dark. Also, the type 1 and two surge protector can be mounted at the service entrance or any panel locations. The company offers $50,000 connected equipment warranty upon purchase.